Fans mainly consists of blade, motor,frame,protect net,bracing cage,shutters.The motor drives blade to cause air flow and louvre window can open and close automatically to keep the dust from entering. Frame using advanced automatic processing,height precision. Extra-depth zinc coating frame,corrosion resistance strong.High-strength aluminum alloy casting wheel,the reasonable perspective of the type,to reach the maximum air flow.High-precision micro-computer-aided manufacturing system can make the best of its fans. Five rigorous quality testing procedures,noise detection,vibration testing,concentric rotation performance testing,speed of blade testing and the whole fan efficiency detection..380V special motor. 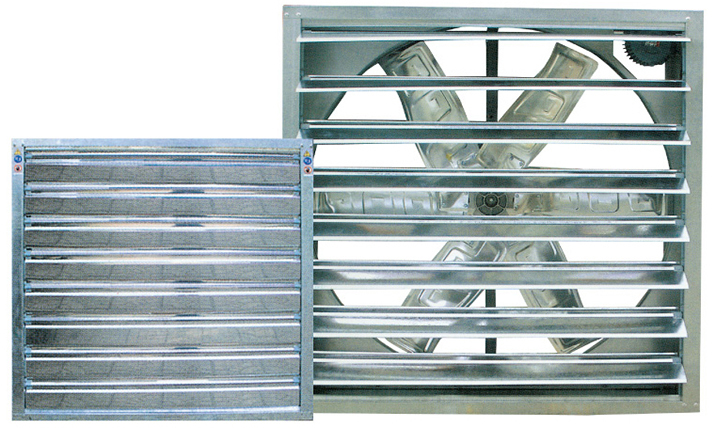 The air blower outer covering guard shield design uses the standard galvanized sheet,the pressure muscle strengthens,a ramming formation;It uses the advanced rivet craft assembly line standardization production, the performance stable does not distort, and it may compare favorably with the import product. The air blower leaf blade has two kinds be possible to choice:Walks slowly and aimlessly the zinc plate and the stainless steel plate.Characteristic:After the rust prevention performance good,the stopping property well,hundred leaf blades closed lightproof does not ventilate. The hundred leaf blade of new nylon supporting lineage,may cause the air blower louver to open shuts light and lively both and rapid. The leaf blade coordination is precise.The air blower width only then 400mm,increased time the transportation loading greatly. The transmission belt uses rises automatically the tight organization,cannot relax,fall the belt,the operation service is simple. The steelyard weight opened the installment to guarantee thoroughly the louver leaf blade opened shuts the reliable arriving,has avoided because of leaf blade opening not to amount of wind loss which 90∑ created. It uses automobile wheel hub special use axle bearing strength high,lasting durable. The air blower actuates the wheel hub and the fan blade place uses a high strength magnesium alloy material compression casting formation.The weight is light,the performance is fine,has provided the guarantee for the air blower steady running. Every air blower is transient examination by the high accuracy equilibrium;the air blower revolution does not vibration steadily. The leaf blade selects the high quality stainless steel material, the novel streamline form outward appearance,has guaranteed the air blower current capacity in a big way, the wind resistance small,the noise is low, the highly effective energy conservation.It Uses a ramming formation craft,causes each leaf blade shape to be consistent.